It can be a lot of fun making your own light fixture, but it can and usually does, cost more than a commercially available light fixture. However, if you use SMD5630 LED self adhesive tapes, you can possibly keep the cost down, and still enjoy a good DIY project. I made such a light fixture a few years ago, with mixed results. It did work, but I had a lot of trouble keeping the tapes sticking where I put them. And, it took a lot more of the tape than I expected. Now, I'm pretty sure I'm going to give it another try. 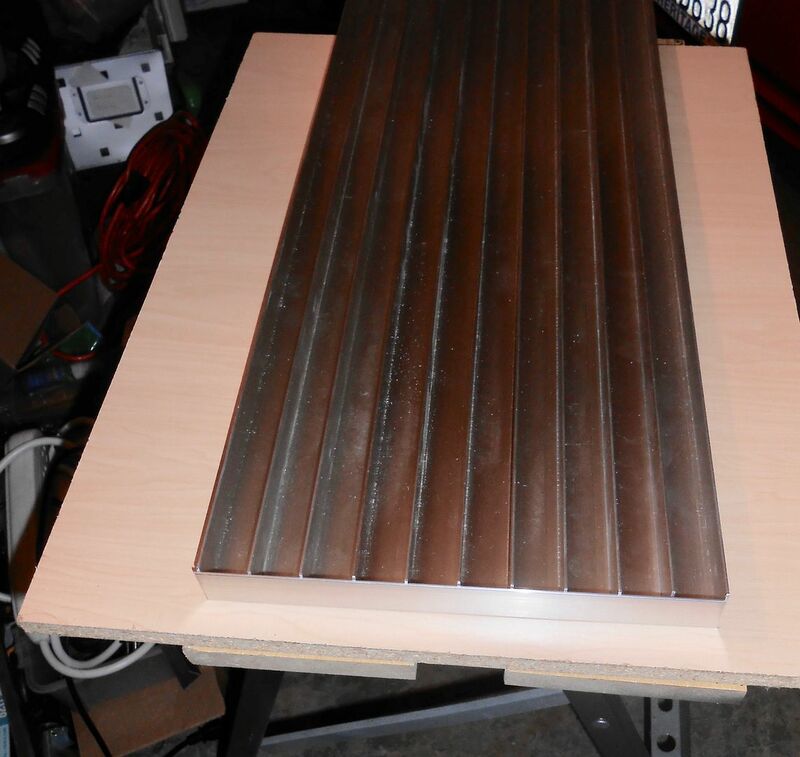 This time I plan to use extruded aluminum channels, and angles, as the heatsink/base for the LEDs, to act as reflectors to amplify the light from the LEDs. (My last light used an aluminum foil lined shade as a reflector to amplify the light.) I will mount the LED tape inside the channels (actually angles), so the sides of the channels reflect stray light down to the tank. 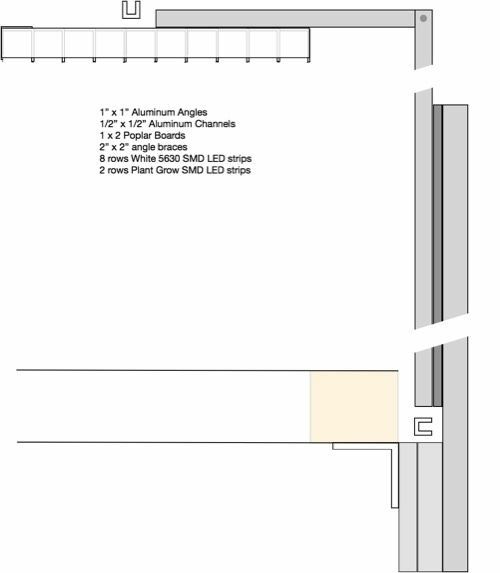 Each row of LEDs will be inside a 1" x 1" aluminum channel. Using the data I collected from my last light I think I can get about 50+PAR, at 36 inches distance, from 8 rows of SMD5630 LEDs. To keep the tapes from breaking loose from the aluminum heatsink, I plan to use beads of silicone cement or epoxy at the edges of the tape to help keep the tapes where I put them. If all goes as planned (please stop laughing!) this will cost me about $100 total for a 32 inch long light. As I go along I will be posting photos and sketches to chronicle my adventurous fun! This is a sketch of my design. The channels are aluminum 1 x 1 angles. The bracket holding it is made of 1/2x1/2 x 1/8" thick aluminum channels, so the power cable goes over the top, in the channel. And, this mounts to a drawer slide, attached to the back of the stand, to let it move up or down. 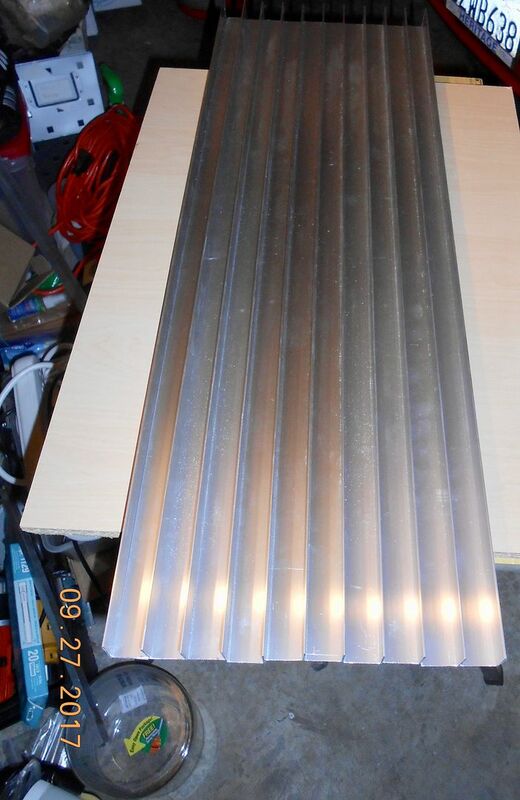 I just purchased 4-8foot long 1 x 1 x 1/16 aluminum angles - $26.50. Now, I'm committed! Interesting project and something that I have toyed with but never moved. Glad to see somebody actually doing rather than just thinking, like myself! Any chance the metal is thin enough or the LED protrude enough to drill at each LED and mount the tape on top rather than fighting the fight to stick it on? Thank you! That is an interesting idea. The LEDs are 5.6 mm x 3.0 mm, not circular, but rounded corner rectangles. The light will have about 500+ LEDs, so it would take that many precisely located and sized holes for this to work well. As a garage corner workshopper I lack anything that would let me do that. The angles are made of 1/16 inch thick aluminum, so I doubt that is thin enough to make it work anyway. If I had thought of this before buying parts I might have found a way to do this, but now I can't. 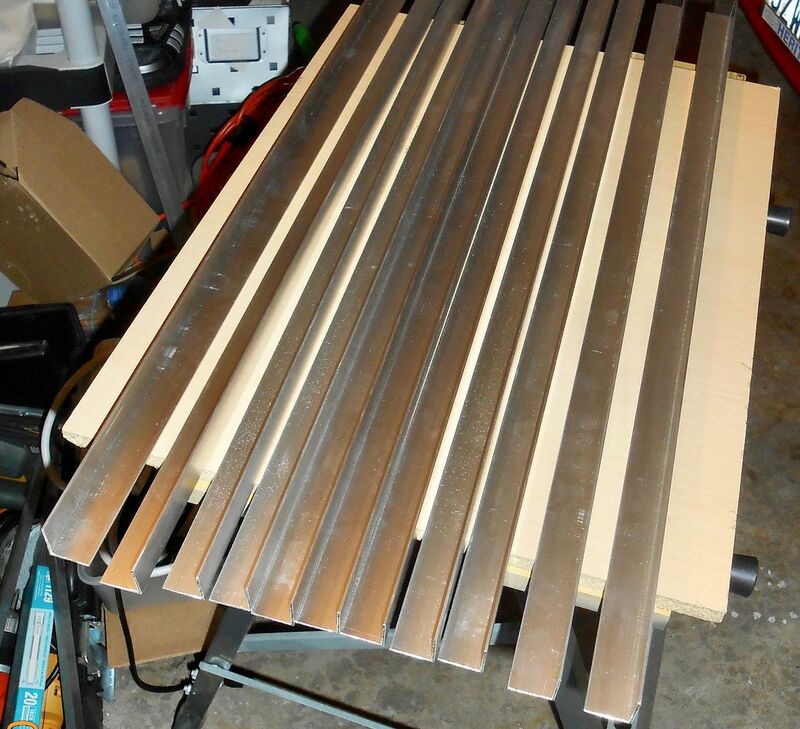 Also, I found it tedious to cut 11-30 inch long aluminum angles, deburr all of the edges, clean each piece thoroughly, drill all of the needed holes in each piece, etc., so I'm sure I would never be willing to do anything 500 times! My $100 budget isn't holding up too well. I have already spent $101, and have at least $10 more to buy. Has anyone used Sugru - https://sugru.com/getting-started/ho...mooth-surface? It looks like it would hold the edges of SMD tapes down very well and be pretty easy to use. Eleven 30 inch long pieces of 1 x 1 x 1/16 aluminum angles. The angles all stacked up to make 10-1 x 1 channels. With the 10 inch long 1 x 1 angle end piece. Nothing screwed together yet. The LED tapes will go inside the channels, with the flat bottom of the assembly being the top of the fixture. With you on the idea that 500 holes is too many! I had not figured how many that would be. I find it is often easy to think but it gets harder when we come to "DO". Heat does make the choice of adhesives more difficult. Some kind of industrial stuff like used on engines? Any idea how contact cement might do with heat? I suspect the expansion of the aluminum requires the adhesive to have some give to it to stay long term? Thinking and looking at adhesives, would this be anything of value? I can't use an adhesive, or even double sided tape, because I would then have to remove the existing double sided tape, without damaging the LEDs. Otherwise, the double sided tape would just release from the LED tape later. My idea is to get the best bond I can from that existing double sided tape, and use a bead of some kind of sealant along the edges of the tape so it takes some or all of the weight of the LED tape. I was looking for a silicone product that comes in a tube so I could extrude out the bead easily. That lead me to the Sugru, which I had never heard of. It seems to be more expensive than it could be, but if it actually works as well as it is advertised to work it would be worth it. I have used silicone bathroom grout for similar purposes, but the Sugru might be easier to use.